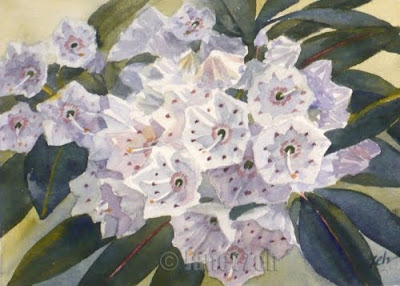 Mountain Laurel is the state flower of several states including my own. Its pretty mounds of delicate white flowers fill the woodlands when it blooms. So pretty! The detail and soft colors in the shadows of the flowers make this painting special. You can find my floral paintings and prints for sale at JanetZeh.Etsy.com. Thanks for stopping by. I hope you have a lovely day!